It's not every day that we get a chance to stare history in the face, and marvel at how the good folk of yesteryear looked ... well ... a bit like us, but if you mosey down to the Tate today you'll be able to do just that at their Salt and Silver exhibition. The costumes, the gentlemen's whiskers and the hair styles belong to another age, but stripped of the fashion foibles of their time, the faces that look out at us look just like the ones we see in the mirror every morning. Look at this photograph below. It's thought that the subjects were mother and son. I wonder where Dad is, and why he's not in the frame too. They're posing in their Sunday best, and mum's seated on a chair to rest her weary legs. Her nails look like they belong on hands that work hard every day, rather than hands that get treated to time-consuming manicures. Just look at the way she's threading her arm proprietorially through that of her son; look at how she's gazing with maternal affection at her pride and joy. It's an attitude that wouldn't look out of place in a status update photo posted on Facebook today. I love how the boy's neck tie is a bit askew with a loose end jutting out too far to the left of his chin. Maybe he was proud of having tied it himself for the very first time that morning. Many of the photos in the exhibition are small, which creates logistical difficulties for someone with terrible eyesight like yours truly. And I'm sorry if you were there at the same time as me, and I seemed to be hogging some of the exhibits with my nose as close to the glass as I dared put it. The truth is that I found those faces and portraits from the far-distant past totally compelling. I really had to tear myself away from some of them to give the rest of the people in the gallery a chance. The whole shooting match kicked off with an amazing polymath called William Henry Fox Talbot who figured out how to make his first camera way back in 1835. Apparently he was motivated to do so because he was a bit rubbish at sketching. He'd used the camera obscura and the camera lucida to help him with his compositions and got to wondering whether he could invent some new gizmo that would capture the scene before him without needing to resort to pencil or charcoal. In time he came up with the technique of producing a negative image of the subject using paper soaked in silver iodide salts. These darkened on exposure to the light producing a negative image of the subject before them. This negative image was then photographed again to produce a positive image. It was a fiddly process by the standards of today, but it was easier that what his rival photographer, Louis Daguerre, was doing with his cumbersome plates. The image (below) of Nelson's column as it was being constructed was taken by Fox Talbot himself. Isn't it amazing to see a scene that many top-hatted Londoners must have driven past in their carriages tut-tutting over? They probably thought it an eyesore and a huge inconvenience. And just look at all those bill posters that entrepreneurial types have stuck to the hoardings to promote their wares. How very 21st century! Look at the little wooden hut, where I'm guessing the workmen would have locked away their tools of an evening when their day's work was done. It looks just like next-door's garden shed. 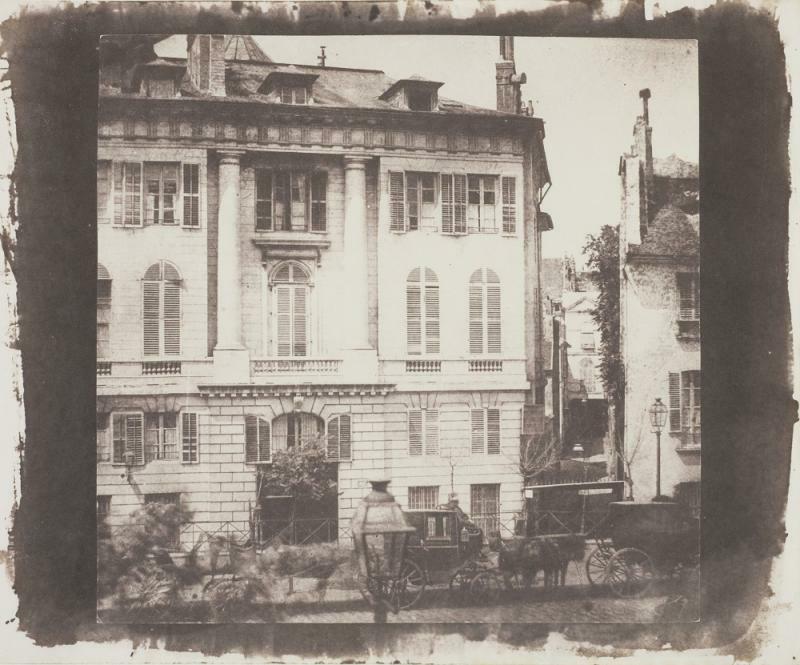 And the image below is another one of Fox Talbot's, showing the view from his hotel window in 1843 when he'd gone to Paris to promote his newly invented salt prints. Isn't it an intriguing snapshot in time of a Paris street scene with the cabbies all patiently waiting in a line for a fare? I was enchanted by some of the bucolic scenes of country life. 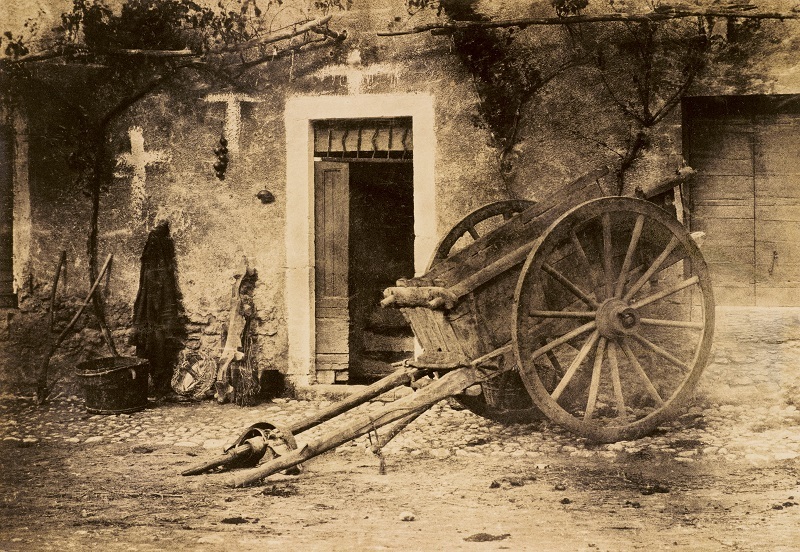 Just look at the wonderful image below by Paul Marès of an Ox cart in Brittany, taken in about 1857. Doesn't it look charming? Like it could have been painted by the Impressionists? For me it is a perfect example of that soft, velvety texture that was a key characteristic of the technique, and made the image appear much more arty than the sharp definition of the contemporaneous Daguerrotypes. However, those white crosses that were painted on the wall, seemed a bit sinister to me. They jar with the gentle charcoal quality of the composition. On reading about the image I learned that they were commonly painted on walls of rural houses to warn passers-by to keep their distance when the occupants had succumbed to some awful infectious disease. That little nugget of information brought a sinister note to the idle ox cart. Was the driver suffering alone somewhere in the bowels of his home when the image was captured? Did everyone round about feel terror clench their chests when their eyes fell upon those markings? Did they all walk on by and ignore the plight of the people inside? Do they look as though they're swaggering to you? Once again, in the age of self-promotion on social media, I find their pose thoroughly 21st century. Dressed in jeans and t-shirts they could be a bunch of lads off on a stag weekend. I wonder what they thought about getting their photograph taken? Did they even understand what the man with the strange camera was doing? Did he ever come back and show them their photograph after it had been printed? And for me that's the lovely thing about this exhibition: it gets you started on a journey of a thousand maybes. As you look at all these individual moments in time your mind, or maybe your heart, craves the backstories and the what-happened-nexts. For anyone with an interest in either social history or the history of photography this exhibition is totally compelling. If you'd like to go along and see what all the fuss is about for yourself you can check out the website here: Salt and Silver: A rare and revealing collection of early photography. It's running until 7th June. Enjoy!